As the Oct. 5 deadline draws near, thousands of immigrants are rushing to get their DACA renewal applications accepted by U.S. Citizenship and Immigration Services to avoid the risk of deportation. With the September announcement by President Trump’s administration to rescind the Deferred Action for Childhood Arrivals (DACA) program, which includes a six-month phase-out plan, immigration reform is a topic that seems to only get uglier with the daily tweets of those citizens and political figures who feel comfortable thumb-thugging behind a keyboard. Immigration and border security has been a hot-bed issue in the United States for many decades now. And as I listen to the various arguments about the repeal of DACA, I find it problematic that this is tied to border security, and of course Trump’s “wall.” It’s apparent that the Republican party doesn’t give a damn about either issue, and are more concerned with undoing everything President Obama did, just to try to replicate the same ideas under a different name and administration. Here’s why DACA is not about immigration. 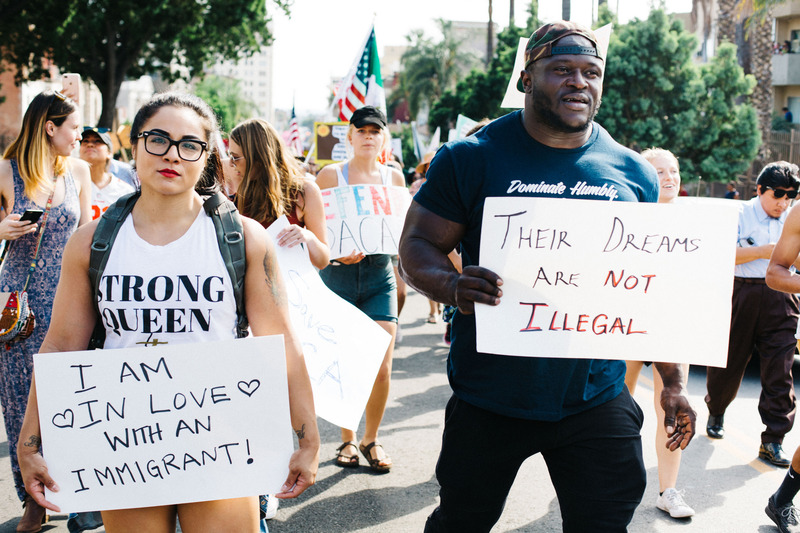 While Mexico and other Latin countries make up the five countries of immigrants under the program, South Korea, Philippines, India, Poland and Jamaica are also on the list of top countries of origin for DACA immigrants. Yet, whenever pundits and politicians discuss DACA, it’s most always accompanied with border security issues with Mexico and ‘building the wall.’ How do these other countries affect U.S. immigration, and how will these other countries handle this administration’s decision? In 2012, Obama created the DACA program, which protected approximately 800,000 undocumented immigrants who entered the U.S. as children. Often referred to as "Dreamers," these immigrants were safe from deportation and allowed to study and work in the U.S. legally. As long as these Dreamers were under the age of 31 as of June 2012, they received a renewable two-year work permit. So, what’s the big deal? The Sept. 5 announcement made by Attorney General Jeff Sessions came ONLY after Texas and nine other states threatened to file a lawsuit if the program was not rescinded. These states include: Alabama, Arkansas, Idaho, Louisiana, Nebraska, South Carolina, Tennessee, West Virginia, and Kansas. According to United States Citizen and Immigration Services (USCIS), apart from Texas, these states are not even in the top ten states that have the largest population of Dreamers. As a Texan and Houstonian, I can tell you that many of us do not share the same sentiments as our Attorney General Ken Paxton. As a Texan and Houstonian, I tell you that this will have severe negative implications in Texas if Congress doesn’t come up with a solution. With 234,350 DACA recipients, Texas has second highest population of Dreamers that reside, study, and work in the lone star state. According to the Center for American Progress, Texas could potentially lose an approximate $6.1 billion annually if even 100,000 of the state's workers were deported. California, which has the highest population of DACA recipients with 424,995, has filed a lawsuit against the Trump administration challenging the constitutional legality to rescind DACA as reported by the Los Angeles Times. The National Association for the Advancement of Colored People (NAACP), DACA Recipients, about 15 states, and several other organizations have also filed similar lawsuits challenging the Trump administration on the rescinding of DACA, according to the Los Angeles Times and the American Immigration Lawyers Association. Critics claim these recipients are taking away benefits and jobs from Americans, and (also) that Obama’s executive order was unconstitutional. In the "DACA talking points" memo, the White House specified a variety of bullet points outlining the administration's action. "The Department of Homeland Security urges DACA recipients to use the time remaining on their work authorizations to prepare for and arrange their departure from the United States -- including proactively seeking travel documentation -- or to apply for other immigration benefits for which they may be eligible," the memo says. DHS spokesman David Lapan has received tons of flack for saying, “No one has an entitlement to live in the United States illegally.” While this statement is true, many of America’s first settlers were here illegally. I’m not sure where this "entitlement" comes from by the Republicans, but clearly, they weren’t paying attention in U.S. History class. Or, is being in America illegally okay if individuals are captured, enslaved, and made to work for Caucasians for their own economic benefit? Last month at the White House, Trump met with Senate Minority Leader Chuck Schumer and House Democratic Leader Nancy Pelosi to discuss a deal that would protect DACA recipients, along with an “alleged” agreement on border security that was passable to both sides and which excluded "Trump’s wall." The statement released by Democratic leaders may have been premature as Trump tweeted that no deal was ever made. In his Sept. 14 tweets, Trump softened his tone and alluded to the possibility of being in favor of a solution that would allow DACA recipients to remain in the US. In a follow-up tweet trump stated, "They have been in our country for many years through no fault of their own - brought in by parents at young age." According to the Office of the U.S. Trade Representative, Mexico is currently America’s third largest goods trading partner with $525.1 billion in total bilateral trade during 2016. Mexico is the world's largest grower of avocados and their largest buyer is who? You guessed it, America. With a lot of America’s imports coming from Mexico, DACA repeal does not seem like an ideal move to make. Again, I ask, if immigration is so important to this administration and the Republicans, why is the sole focus on immigrants from Mexico? We should be focusing on immigrants who come here illegally from all countries, right?